There’s no better confidence booster than seeing what you’re actually capable of. What does it mean to get fit? It may look different for everyone. For one person, doing one hundred burpees in a row is a huge accomplishment and one that they were only able to accomplish after working hard to build up their strength and conditioning. Another person may have always thought that it would be totally impossible for them to ever do a handstand, yet after months and maybe even years of practicing (this stuff takes time! ), it’s finally starting to feel like a skill they’ve mastered. Guess how achieving these things makes these people feel? Not only did they get fit, also their confidence skyrocketed! Another reason why you should want to get fit is to have more energy. We’ve seen it over and over: once someone decides to start putting in the work, show up consistently and get fitter, their energy levels improve. Sure, it may be hard to get up in the morning or work out after work when you’re tired, but once you get yourself out and moving, your energy levels increase and your mood even often improves. You will definitely feel more energized after you’ve worked out, which is another reason to get fit! Working out and being active is important to get fit — but so is the food that we put into our bodies. One thing that happens a lot when when we become more active and get fit is that our eating habits actually improve. We feel better when we move and become more in tune with our bodies, and as a result we often naturally eat better. Food is fuel, and if you eat whole, minimally processed foods most of the time, you can be sure that your body will feel great. Practicing new skills and setting meaningful goals will definitely help you get fit, and also add a ton of extra motivation to your workouts. Learning any new skill will take time, but it will teach you patience and consistency. And eventually, you’ll have a cool skill to show off! Skills should be something that you’ve always wanted to be able to do—some of our favorites are handstands pull ups, or even just a solid push up. It may seem impossible at first, but give it time, patience and a lot of practice, and you can do whatever you put your mind to. Getting fit is like investing money for your future. If you want to have a long, healthy life, you better get fit! Fit people are always healthier than unfit people, even if they weigh more. So don’t stress too much over how much you actually weigh — just get fit enough so that your health stays good now and into the future. Here’s an awesome reason to get fit: to enjoy your life more. When you’re fit, you don’t get out of breath quickly when you’re playing with your kids. You can pick up new active hobbies because you have the strength and endurance for them. You look forward to hiking on Sunday because it’s truly enjoyable when you’re physically fit. 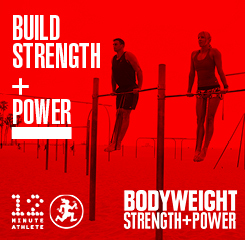 With our workouts, you can get fit and NOT spend your entire life in the gym. You will be able to build a strong body but still have a ton of freedom to do things that you care about! Getting fit literally makes your life easier. Being strong and having good conditioning make your daily tasks easier. For example, when you’re fit, you can carry all your grocery bags to your house in one trip. You can pick up your kids or pets without too much of a struggle. On an airplane, you’re able to place your carry-on bag in an overhead bin without needing anyone’s help. When you get fit, the quality of your entire life improves. Working out isn’t about punishing yourself for eating “bad” food or taking an extra rest day here and there. Fitness is not a tool for punishment, and if you treat it that way, you’re unnecessarily tearing yourself down. Getting fit is all about building yourself up, so you can become the best version of yourself. To get fit, you need to develop a good, friendly relationship with yourself so that you can get even better, stronger and become more successful. That’s when you can truly unlock your potential and become the most badass possible version of yourself. When you get fit, you become a role model for others. Your personal fitness journey can inspire and motivate others so that they decide to get fit too and enjoy all the benefits of fitness that we just talked about. Of course, kids pick up a lot of what we do, so if you have kids or plan on having some one day, you’ll be a great example for them! Why do you want to get fit? Let us know in the comments! useful article, Thanks for sharing the post.